The traditional stuffing for the traditional Christmas Turkey. Preheat the oven to 200°C/400°F/gas mark 6. Melt the butter over a very gentle heat. Finely chop the onion and add to the butter. Cook very gently until translucent but not coloured. Take off the heat, allow to cool slightly and then add the chopped herbs and the breadcrumbs. 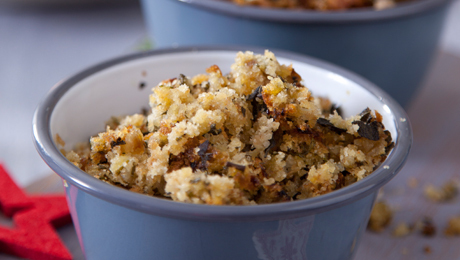 The mixture should not be too dry as it will give you dry stuffing. Season the stuffing and allow to cool completely.